What used to be a terrace on the 2nd floor that nobody used, has now been converted into a light, airy contemporary home office and like the loft conversion, I think it’s going to be an amazing room filled with natural light. The room is being plastered today except this small brick wall which I managed to save and we are putting floorboards to be painted in white. Major credits to the kiwi who, not only does an amazing job, project managing the whole thing (check hashtag bodieandfourenovations on Instagram) but also to the amazing builders we have on site. I will happily share their details at the end of the project. I feel very lucky and grateful. It’s our third renovation work and we worked with “cowboys” in the past which made the whole thing a lot more stressful! So yes the house is a major building site, out of 3 floors, only one room is habitable but I think we are on the verge of creating something pretty cool for ourselves and it’s such a great, creative adventure for our family to do together that I’m pretty sure it won’t be our last project together. I love Steve’s design for his new home office. The large window gives us a fab view of London like the loft conversion and it’s pretty cool to look at the sky in the evening through the two sky windows (which are self-cleaning). I’m also a huge fan of the cladding on the outside, which boxes this new extension. The old ones will be replaced to match the new colour and rather than letting it aged naturally like we did first time around, this time we will treat the wood to maintain its lovely colour. In the meantime, I’m planning to set up my Styling studio in one of the top room. 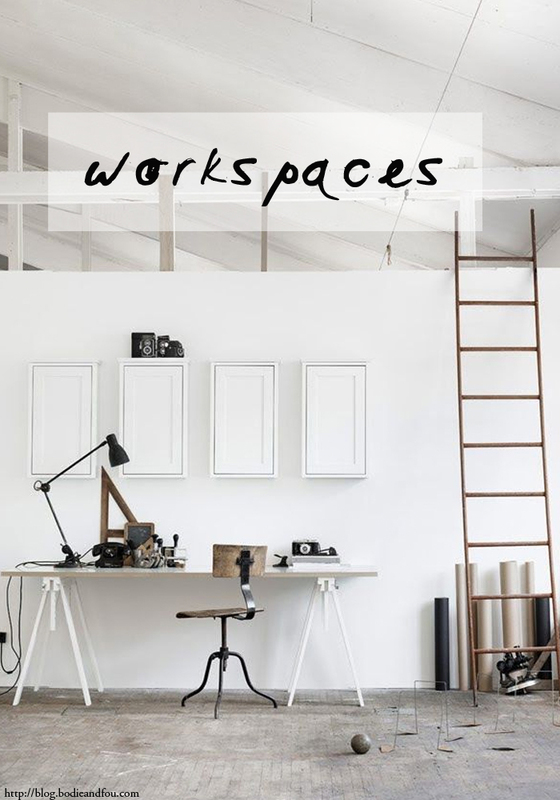 The room is small but it has a gorgeous, natural light and view on my neighbours’ tomato plants so here are a few inspiring, white workspaces mixing clean lines with vintage details and smart solutions. I love how this little space, which is part of a corridor, has been cleverly converted into a small home office and the NA stool by &Tradition is simply gorgeous. When it comes to my home office, I always mix contemporary designs with vintage finds like this one I styled a few years back in Désiré’s home when I went to Amsterdam to shoot the BODIE and FOU catalogue. Rock Flag print, Feathers print, wire letter tray and Industrial clip-on light, all from BODIE and FOU. And this one for kids is such a great idea! Wow, I love this style, so simple but beautiful and elegant. I really like the color combinations. I always prefered working in a bright (white) room.